It’s been a while since I’ve had a good gardening post on the blog, so when Kate approached me with an excellent idea for a gardening guest post I jumped at the idea. Kate has compiled 6 Tips for the Twenty-Something Gardener … and let me tell you these are great tips! Gardening has so many benefits: it allows me to save money, have control over my food quality and eat healthily. While I still supplement my home-grown produce with fare from the farmer’s market and grocery store, there is a certain pride that comes with putting food I’ve grown from a seed onto the dinner table. Before making a garden, if you want to make it look elegant and beautiful, you can contact NBG Landscapes. They offer the best designs depending on your budget. Now, you can have the best garden that you ever have. Visit them at https://nbglandscapes.com.au. This is great for those in their first apartment or living in an urban environment. When I first started gardening, I just bought a few pots and put them on my tiny apartment balcony and researching Sydney landscaping design ideas. 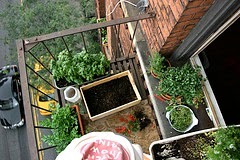 I had friends who started with a few small herbs in their kitchen windows. You don’t need acres of land to start a garden. In fact, I wouldn’t recommend it. The space limitation allows you to start small and learn along the way. Just make sure your balcony or windowsill gets six hours of sunlight a day. Start with herbs like mint, chives, basil or small tomatoes and peppers. Make sure the plant fits comfortably into the pot and has water drainage holes. Pinterest has some great ideas to make your containers as beautiful as they are full! Yes, growing plants takes some attention. But, it doesn’t have to be all-consuming. Water regularly by checking to see if the soil is dry, just don’t over water because that can cause the roots to rot. Also, add fertilizer to the soil when you first plant to encourage healthy growth without much maintenance. If you are going out of town for several days, ask a friend or neighbor to come by to check on them. Keep an eye out for weeds or bugs, but typically plants grown in pots aren’t as susceptible to that kind of thing. If you do find you’ve got some unsightly weeds or crawly bugs lurking in your pots, resist the urge to go nuclear with pesticides. There are plenty of natural options out there like vinegar and salt or organic weed killers. No need to harm your perfectly pruned plants with harsh chemicals! That said, don’t let a fear of commitment stop you from growing health food on your own! Maybe you’ve dreamed of growing a specific type of flower on your balcony, so you go to the nursery and buy five of them, plop them on the terrace, and scratch your head when they are dead in two weeks. Ok, maybe that happened to me. Lesson learned: READ THE TAGS. The little plant tags stuck in the soil are the guidebook for your plants: how much sun do they need? How much space between plants? How much care will it need? All of that information is contained on the tag, so keep it in a safe place for reference. If you are already a tomato lover and have your go to farmer’s market shop, why not try something new? If you don’t usually cook with rosemary or dill, plant those herbs instead. I never buy radishes at the store, but they are sturdy and quickly growing. This made them my choice for a new-to-me garden vegetable. Gardening shouldn’t be stressful, but so many people I’ve talked to mention that it gives them anxiety. Instead, find some peace in the rhythm of planting, the beauty of the growth cycle and the feeling of pride when your mini-garden is ready for harvesting. There are many life lessons to be learned from gardening — patience, lack of control, and attention to detail among them — so don’t get stressed. Ok, don’t literally hug it. But every gardener I’ve talked to has failed to grow at least one thing they’ve planted. It’s a badge of honor, not a scarlet letter. When a plant starts to look withered, try to cut it back and see if regrowth will occur. If not, pull out the plant, especially if it is sharing a container with others. The point is, plant death is a naturally occurring part of gardening, and you shouldn’t let it deter your efforts. Gardening is a fun way to provide healthy nourishment for yourself and your family, while learning a few life lessons along the way! If you have enough space in your house for gardening, contact John French Landscape Design Melbourne for Gardens and Pool Creations. Their design ideas and experience cover pool landscaping, steep, difficult blocks which require solutions for retaining, stormwater management and soil erosion, sustainable native gardens, drought tolerant gardens, courtyard designs, large acreage landscaping, balcony landscaping ideas as well as the quarter acre block.